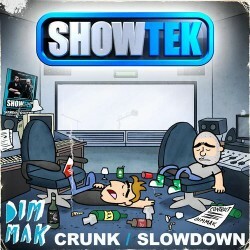 Showtek – "Crunk" & "Slow Down"
Dim Mak Records, known for their high energy and heavy-hitting roster of artists, returns with some of the hardest artists in the industry, Showtek. Hailing from the Netherlands, the brotherly duo of Wouter and Sjoerd Janssen have broken into the electro house arena and fused it with their hard dance roots. This year already has seen them conquer some incredible milestones with a new monthly podcast and a whopping 150,000 Facebook fans. Add to that this two-track release of “Crunk” and “Slow Down”. These songs are ideal for festival crowds, filled with catchy vocal samples, extended climbs and hard Dutch drops. March will be a busy time for these guys, so take a look below for tickets to a show near you.